Settlement Capital Corporation (SCC) is a specialty financing company that provides liquidity to owners and holders of periodic payments resulting from structured settlements, annuities, lottery winnings, government and commercial contracts and other secured future payment obligations. 1. Dynamic subpages: Admin can add/edit/delete content pages and control the subpage navigation menus. 2. Dynamic Map: Users can view State Laws by clicking on a map the admin can update. 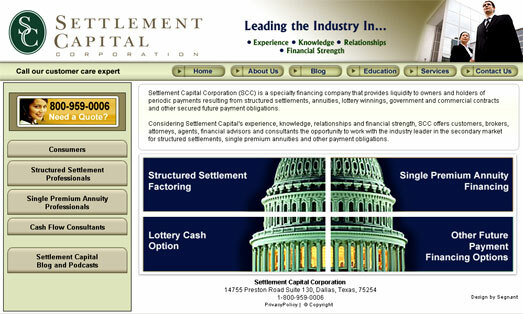 Segnant created a fully dynamic site with robust technology to allow Settlement Capital to educate users and update information.